10 weeks. That’s all it takes to get ready for a half. Well, sort of. * Put your program in your calendar. Write it down. Know it. Love it. * Take your rest days seriously. Seriously. Rest is an incredibly important part of training. If you want to throw in some cross-training on a rest day, go for it, but don’t push too hard. 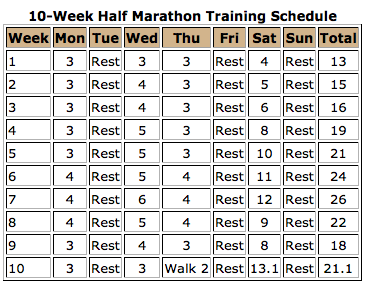 * You won’t actually run the full half marathon distance until race day. Some people are freaked out by this. But if you can run 12 miles, you can run 13.1 miles. I promise. * If you need to move around some days or even weeks for whatever reason (you’re traveling, for example), no problem. Again, it’s a good training program but slight alterations will not derail you. Things happen. Try not to flip out. It’s gonna be OK.